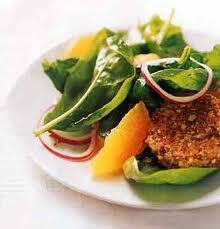 A nice spinach salad recipe...try this one out ! First of all divide the spinach salad leaves onto 4 small plates or saucers. And then cut the goat cheese into small pieces (about the size of a cruoton). Next is to sprinkle the goat cheese over the spinach salads.Sprinkle walnuts over each salad. Sprinkle raisins over each salad. Top with balsamic vinaigrette. The spinach salad recipe is ready... Enjoy this nice spinach salad. Great taste !